B 90 R Adv Dose Bp 11613100 https://www.kaercher.com/tn/professional/floor-scrubbers-scrubber-dryers/scrubber-driers/ride-on-scrubber-driers/b-90-r-adv-Dose-bp-11613100.html Battery-powered ride-on scrubber dryer as successor of BR / BD Trike. With its compact construction, high flexibility and enlarged tank volume it is an agile alternative to every big walk-behind machine. Due Battery-powered ride-on scrubber drier. With its compact construction, high flexibility and earge tank volume it is an agile alternative to every big walk-behind machine. Due to the new brush heads generation disc and roller brush heads with the working widths of 65 and 75 cm are possible. Choose between 65cm disc or 65cm roller head as standard, with the option to fit a 75cm wide head as required. Available with wet or gel batteries, and straight or curved squeegee. Ask for details and order numbers.This version includes the detergent metering system (Dose), which makes a more efficient use of detergents possible. Battery-powered ride-on scrubber dryer as successor of BR / BD Trike. With its compact construction, high flexibility and enlarged tank volume it is an agile alternative to every big walk-behind machine. 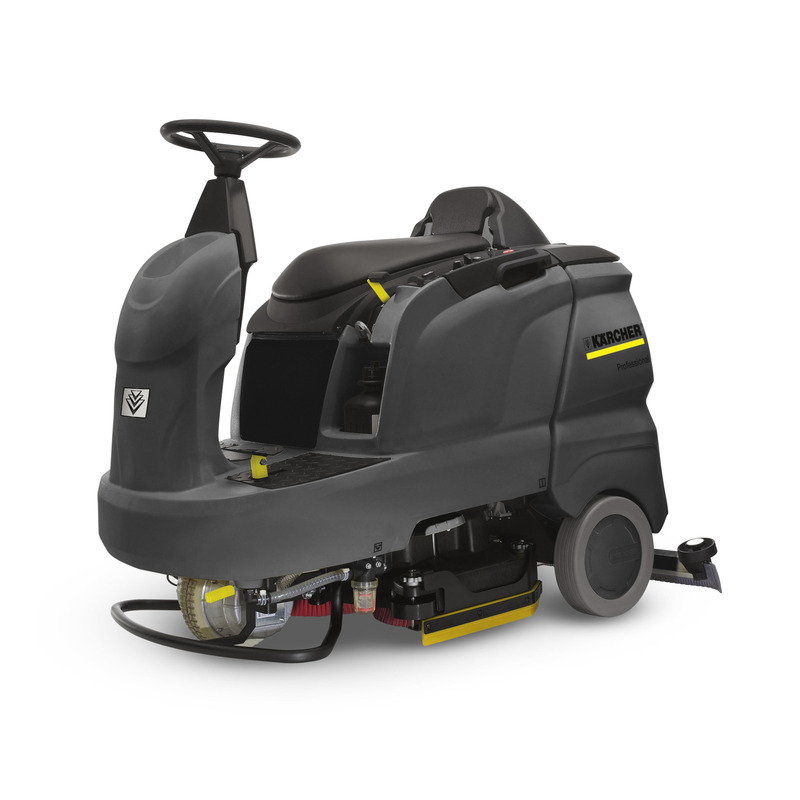 Due Battery-powered ride-on scrubber drier. With its compact construction, high flexibility and earge tank volume it is an agile alternative to every big walk-behind machine. Due to the new brush heads generation disc and roller brush heads with the working widths of 65 and 75 cm are possible. Choose between 65cm disc or 65cm roller head as standard, with the option to fit a 75cm wide head as required. Available with wet or gel batteries, and straight or curved squeegee. Ask for details and order numbers.This version includes the detergent metering system (Dose), which makes a more efficient use of detergents possible. The B 90 R as successor of the BR / BD Trike has an enlarged tank volume, a high manoeuverability and a small turning radius of 1,6 m. Due to its compact design the machine can be transported easily. It can be transported in elevators. The B 90 R is equipped with ventilation openings for the battery case. Different disc and roller brush heads of Kärcher´s new brush head generation can be used in different working widths (55-75 cm). The brush drive operates with star coupling. An easy fresh water filling can be guaranteed. The turbine is protected with an additional washable flat pleated filter against corrosion. Continuous additional metering from the storage tank for cleaning agents. Adaptation of the metering to the degree of soiling during the cleaning. Exact dosage between 0,5 and 3 % (in 0,5 % steps).